This is a fusion of Portuguese and English cuisine – so says the trendy website which also has funky music. We decided to write this review after our second visit as the first was early on when they were just learning the ropes. 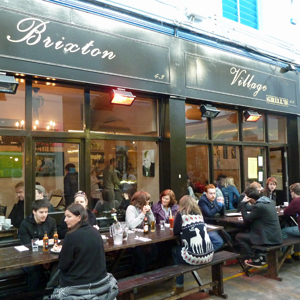 It was a Saturday and we were worried that we wouldn’t find a table anywhere in Brixton Village but on this Saturday we got lucky with an inside table at BVG. This allowed us to investigate the banksyesque pictures- Winston Churchill with a mohican hairstyle, Thomas the Tank Engine being grafittied and a cute take off of Bart Simpson (but we’ll let you see for yourself). The decor is plain (I’ve given up on the word minimalist) apart from the pictures and the two extra large black chandeliers. On our first visit we missed all this because we decided to sit outside as the atmosphere inside the restaurant caught at the back of your throat – burnt fat. But we are glad to report that they seem to have sorted out their kitchen extractor and it was absolutely fine inside this time. The service was very helpful and pleasant from all the waiters and waitresses as they seem to share responsibilities. This meant we never had to try to attract someone’s attention as someone was always on hand. When we arrived they checked whether we wanted a leisurely meal or to cut and run to our next appointment and then chose a place for us – that made us feel they were taking an interest but also means they can turn over tables quickly. The food – a short menu which is always a blessing – is a fish and meat paradise but not much except olives and one main course for vegetarian.It is after all a grill and exactly what you would expect from a Portuguese/English restaurant. There’s steaks, chicken, ribs, and fish – relatively plain but there is peri peri chicken as a starter which may be spicy but we didn’t try it on either of our visits. So for starters we had the rock salt sardines which were good but perhaps could have done with a bit more salt. For main courses we had the ribs,and the fish of he day which was whole sea bream both with chips and salad. The bream was delicious and worth negotiating the bones. The ribs were tasty but a bit chewy. They were washed down with Sagres beer. We asked another table for their views of the red wine and they were in favour of the middle one on the menu – Casa Antiga. For dessert we shared a dime bar cheesecake – a good decision as they don’t go in for meager portions. Overall we would visit again despite the wealth of choices in Brixton Village. It offers simple well cooked food which they can turn out quickly to a good standard and the relaxed ambiance where you can talk without shouting but still feel a buzz means we will take more friends next time. Later reports suggest that the vegetarian dish was very disappointing so perhaps they need to work on extending their menu to attract all types of customers. The price per person is probably around £15 – 20 without too much alcohol but a welcome addition is their loyalty card which means that your 6th meal will have a 50% discount – so you can save yourself for the future blowout.